KOVOT Large Emoji Beach Balls Set Of 3 - Includes (3) 24'' Emoji Style Beach Balls And Foot Pump by Kovot at Scruffs Game. MPN: 43224-634. Hurry! Limited time offer. Offer valid only while supplies last. Be the life of the party with the KOVOT Large Emoji Beach Balls. The set includes: (3) 24'' Inch Emoji Style Beach Balls and (1) Plastic Foot Pump. 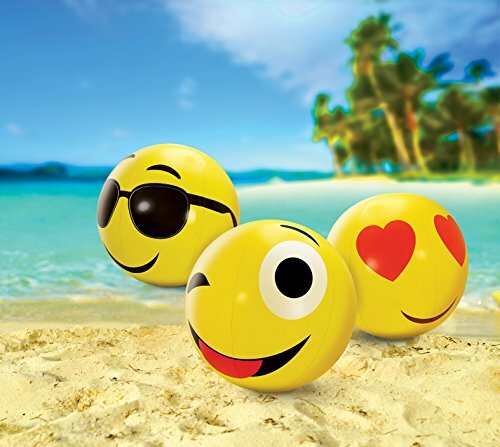 Be the life of the party with the KOVOT Large Emoji Beach Balls. The set includes: (3) 24" Inch Emoji Style Beach Balls and (1) Plastic Foot Pump. The emoji expressions on the balls are: heart eyes, sunglasses, and wink face. These large 24" inch balls will be a hit at any pool, beach, party, or event. Made of thick and durable vinyl plastic - built to last. Includes foot pump for additional convenience and value. Inflate balls to max capacity to avoid wrinkled look and for best experience.